Wow! Are you ready for this one? This interview I did with Dr. Valerie Young, author of The Secret Thoughts of Successful Women, was from all the way back in 2013! I looked at my podcast list and I never shared it with you! Oops! I blame pregnancy brain. So I know that was a long time ago but I can’t even tell you how many times I went back to this interview because the content was truly life-changing for where my career took me after 2013. Today we are talking about the impostor syndrome. 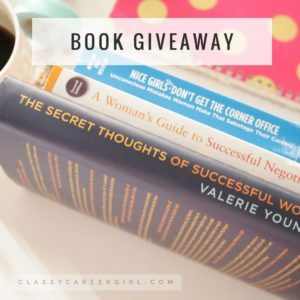 Another big bonus to go along with today’s podcast, I am also giving away Dr. Valerie Young’s book along with two of my other all-time favorite career books on Instagram this week, so if you are listening come follow us and check it out @classycareergirl on Instagram!! We have more giveaways all the time so come stop by. The Impostor Syndrome is where many high-achieving females tend to believe that they are not as intelligent as other people think. When I was asked to speak in Brazil just a year after this interview in 2014, I had some major impostor syndrome happening. Who was I to speak to 800 women internationally and be treated like royalty while I was there? I had to get over this negative mentality to achieve a successful first international speaking engagement. Note: Make sure ou download our career satisfaction quiz too! In this book, How Women Lead, The 8 Essential Strategies Successful Women Know, Virginia Rometty, CEO of IBM, recounted a time when she was offered a new position. She asked for time to think about it and that night talking with her husband, she declared she needed more time to develop the experience and skills required for the job. He asked if she thought that was what a man would say. The next day, she accepted the position. She learned throughout her career to always take jobs that put you in a zone you don’t know. You have to be comfortable being uncomfortable. One of Mayer’s mantras for making decisions in life is to a) work with the smartest people she can find, and b) go for a challenge that makes her feel like she’s in over her head. So is there an opportunity or position that you are afraid to take because you don’t think you are ready for it? I am telling you today that WHO CARES! GO FOR IT! You will never be 100% ready but that is when you the best opportunities come. Challenge yourself and start taking risks. Be comfortable being uncomfortable and step up! Expect to be lucky. Put yourself in situations to find luck. You can’t control what other people think. You can only control your own response. Make it a skill to wing it. People who feel like frauds sometimes believe that they are where they are because they happened to be in the right place at the right time. Don’t dismiss your achievements because of timing. What did you think of this interview? Share in the comments below!